The reality is it’s not very easy to get to Alonnisos because there is no airport on the island. While this makes it more challenging to reach the island, it also tends to limit major tour operators’ ability to bring large groups of tourists to the island at one time. That means Alonnisos doesn’t attract anywhere near the same volume of visitors as the neighboring island of Skiathos, which actually has an airport that can accommodate Boeing 737 aircraft with 200 or more passengers per plane. This of course translates into greater opportunities for experiencing more peaceful and enjoyable holidays. When you fly into Athens, there are flights available from there to Skiathos. In past years there haven’t been a lot of them, but just check one of the major travel websites (e.g., Expedia, Travelocity, etc.) to learn about specific dates and times of departures. Overall, I highly recommend booking reservations as early as the airlines will allow, as these flights tend to fill up quite rapidly since the planes used tend to be quite small. If you do intend to reach Alonnisos by boat from Skiathos, then prior to your trip you need to reserve and pay for boat tickets in advance. The Hellenic Seaways website is fairly easy to navigate, just be sure to choose your language of choice, then select “Online Booking” and follow the prompts. 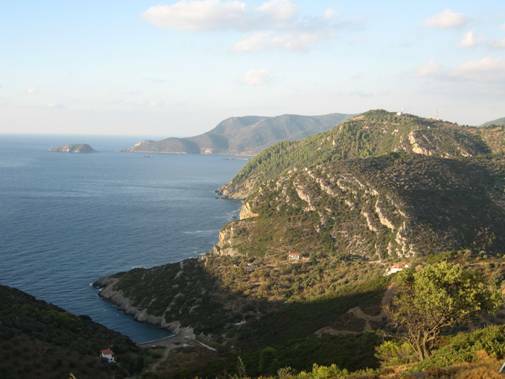 In the summer there are typically four departures per day from Skiathos to Alonnisos. As of the summer of 2018, it’s my understanding that Hellenic Seaways will allow you to use a printed confirmation of your reservation (with barcode) as proof of your ticket(s). However, just to be safe, if you have the time to do so stop by the office of the Hellenic Seaways representative in Skiathos (called “Skiathos O.E.“) with your confirmation and they will print you actual tickets. They also may ask you for a passport for identification. The office is located directly across from where the boats arrive and depart. When you have your ticket(s), if the boat is leaving shortly I recommend you promptly proceed to the boarding area which is across the street from the travel agency. Please note that a company called Aegean Flying Dolphins also operates older boats called Flying Dolphins that are smaller, and somewhat less comfortable than the Flying Cats. They are however, a bit faster than the Cats, and the price of the tickets is somewhat less. Note that if you have any concerns about rocky seas you may want to limit yourself to only booking a berth on the Flying Cat. Another option is to book passage on a ferry boat, which takes more time for obvious reasons. I recommend using the OpenSeas.gr site to learn what other boat options exist. On your day of departure the flight from Athens to Skiathos will take approximately 40 – 50 minutes. After arrival and baggage pickup, proceed to the taxi line and request a ride to the port in Skiathos town (about a five minute ride), and specifically ask to be dropped off near the port agent you need to see to pick up the tickets (i.e., the one for Hellenic Seaways or the one for the Aegean Flying Dolphin). Be aware that if your travel party is just 1 or 2 people, the taxi driver will be quite insistent about taking along another 1, 2, or 3 passengers. You essentially have no choice in the matter unless you want to pay the driver double fare. It’s just one of the many novel quirks about traveling in the Greek islands! If you have some time to wait for your boat departure (45 minutes or more), there are numerous cafes and bars on the waterfront with outdoor seating that provide Wi Fi access if you need to check email. When it comes to the boat departure, whatever you do, be certain to be ready and waiting for the boat at least 10 minutes in advance of its scheduled arrival time because Greek boat captains are not known for their patience with dawdling passengers. Once they pull up the gangplank they typically will not put it back out there for you if you happen to arrive just as they are leaving. If, based on your travel schedule your arrival in Skiathos is too late to connect with a Hellenic Seaways Flying Cat, and Aegean Flying Dolphin, or a ferry to Alonnisos, you will obviously need to book hotel for that evening. To assist you in this regard here’s a link to a property I recommend called the Hotel Stellina, and a link to another recommended property called Fresh Rooms.